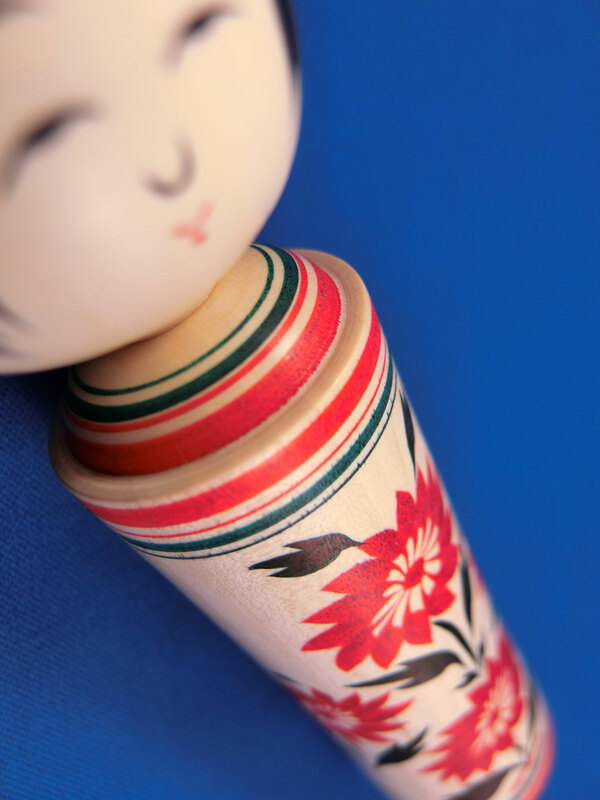 Beautiful "Kokeshi" dolls have been around for hundreds of years. Believed to have originated from the Tohoku region in northern Japan. 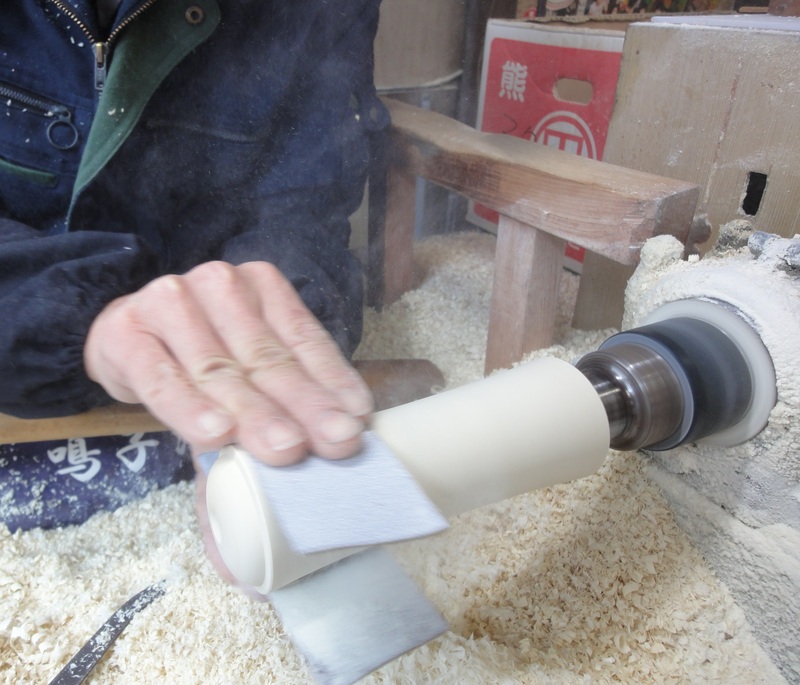 The Tohoku area is well-known for its onsen (hot spring) villages, and it is said that the woodworkers who used to make bowls and trays began making simple dolls in much the same manner. 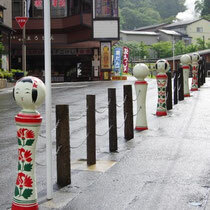 These dolls were meant to be sold as toys and souvenirs for the tourists who visited the onsen resorts. The craftsmen made very kind and delicate works. The body and head is round because they avoid child's injury from it when they fall down or even if children put it their mouth. 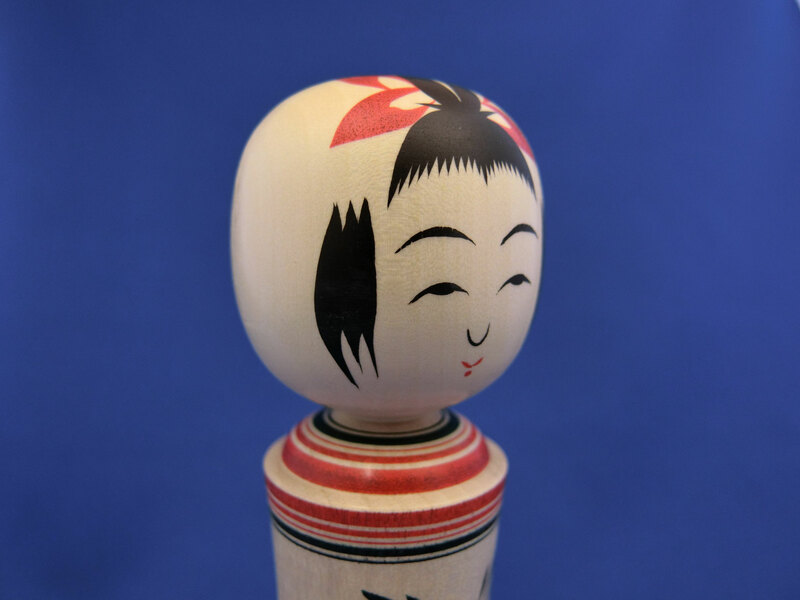 During the Edo period, the kokeshi were considered to be the guardians of children and the keepers of their souls. Thus, these dolls were considered images of the children themselves and were expected to watch over them as they grew up, and more importantly, keep them from harm. 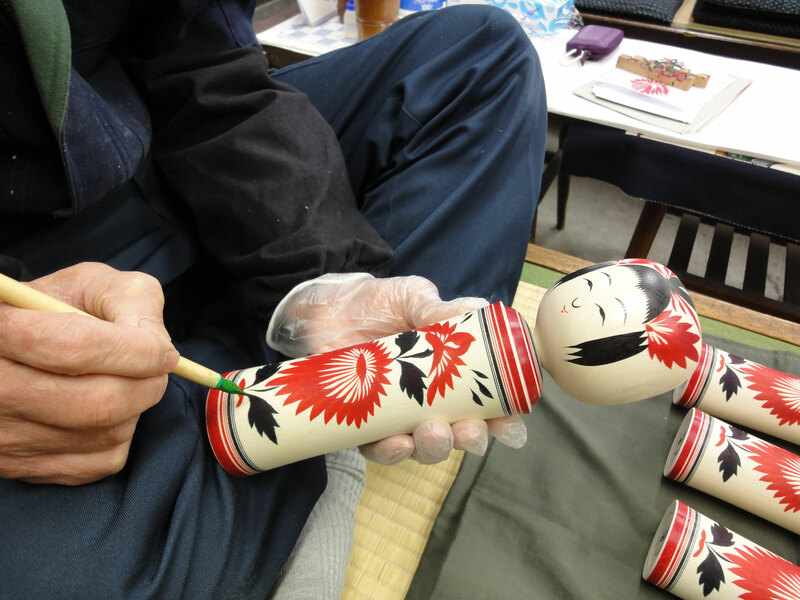 Japan's iconic kokeshi dolls have recently experienced a surge in popularity. They have become an adored collector's item. 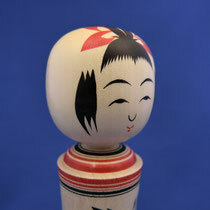 The traditional Kokeshi dolls became intimately associated with onsen (hot spring) areas. Today, there are 11 areas – in all 6 Prefectures of Tohoku. 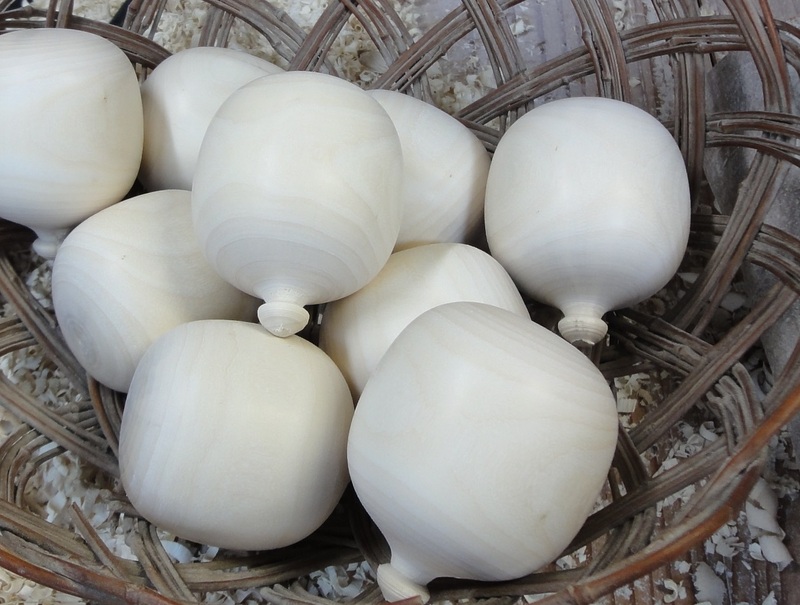 The doll's shapes and patterns are particular to a certain area and are classified under 11 types (Yajirō, Tōgatta, Naruko, Sakunami, Tsuchiyu, Yamagata, Zao, Hijiori, Nanbu, Kijiyama, Tsugaru). Each locale’s dolls are unique, reflecting the motifs and characteristics of the local people, history, plants and folklore. The materials, too, differ depending on where the dolls are made, with the craftsmen using whatever wood was easily available. 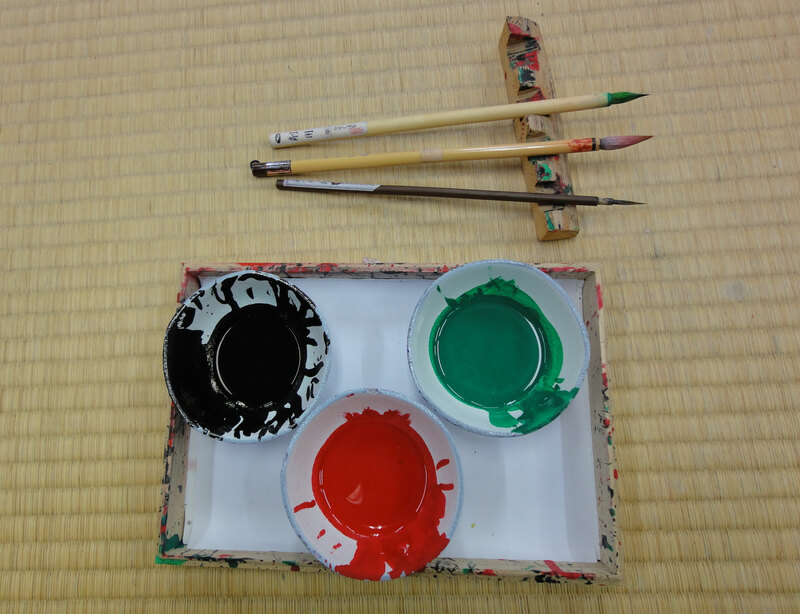 On the Pacific side of the region, it tends to be dogwood, which is hard and has a white color, while near the Sea of Japan, painted maple, which is yellower in color, is often used. 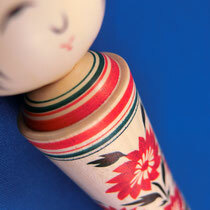 Traditionally, kokeshi dolls were crafted in only 3 colors―either red, black, green or sometimes, yellow. However, modern artists now foray into different designs and colors as well. 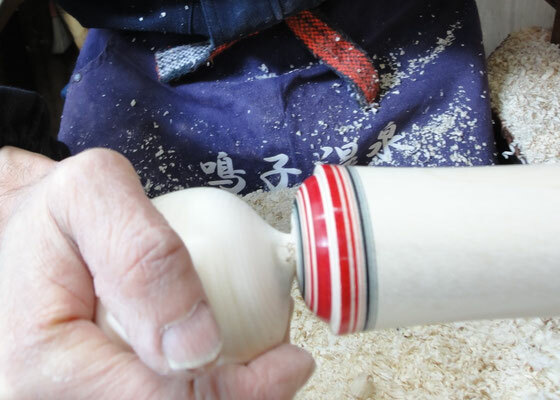 The most prolific of all traditional styles, the Naruko (more properly pronounced "Narugo") kokeshi is also one of the earliest. It has influenced other strains. The Naruko kokeshi originated sometime in the Edo period at the Naruko Onsen village in Miyagi Prefecture where is one of the most popular hot-spring spa resorts in Tohoku. It's not surprising that these souvenirs flourished. 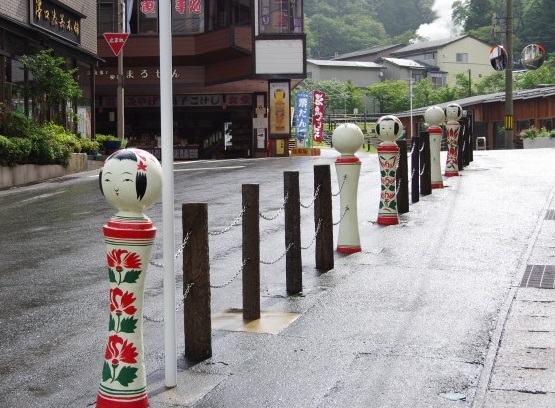 Now, the main street of the Naruko Onsen village is known as the Kokeshi Street and has shops which are operated directly by the kokeshi carvers. The shape seems the most quintessential traditional style. Their thick torso are solid and stable, slightly concave at the waist with definite shoulders. The neatly rounded heads are about the same width as the shoulders, so the proportioning has a secure, classic feel. The hairstyle is normally a black fringe tied with a red ribbon (known as mizu-hiki) and with bangs. The curve of the bangs follows the curve of the eyebrows. The side tufts of hair generally have three brush strokes. Their faces are understated, with small features that include single-lidded eyes and cat-like noses. The lips are small, made with two minimal touches of the brush. The body itself has often designs of chrysanthemums as well as striped patterns around the shoulder. Only red, black, and green color have been used on Naruko kokeshi, though a few have the base colored yellow before the motifs are added. Very recent ones may have purple. 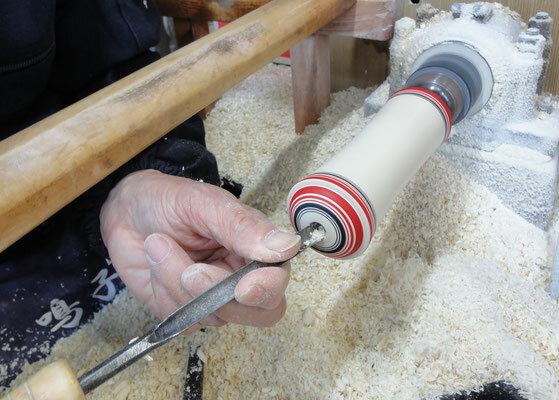 The head part is forced into a hole in the top of the body while it turns on the lathe, using the force and heat of friction. 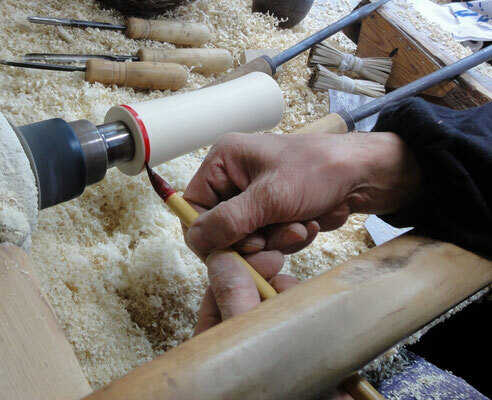 As the wood shrinks and cools, the shape of the neck and the hole change enough that they cannot come apart. 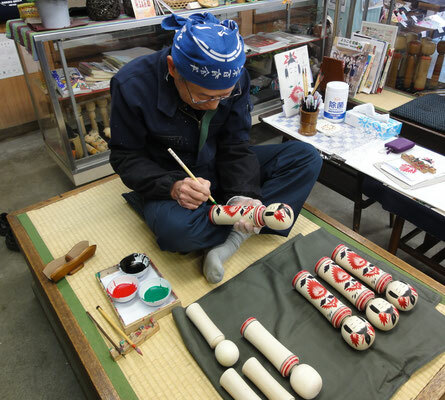 This neck insertion technique called "Kubi-Ire" that the head is not fixed but simply inserted into the torso, make squeaks when turned, a feature unique to Naruko kokeshi dolls. After any rokuro painting of the head is done, the piece can be removed from the lathe, so the face and head can be painted by hand. The hand painting includes the motifs other than circular lines on the body, the head decoration, and the face. After the paint has dried, each one is finished with beeswax. 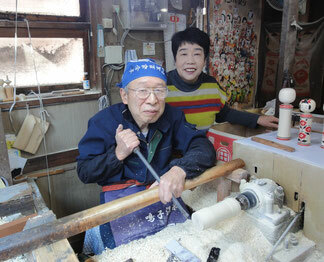 Kokeshi artisan, Seiichi Okazaki was born in 1949 in Naruko, Miyagi Prefecture. 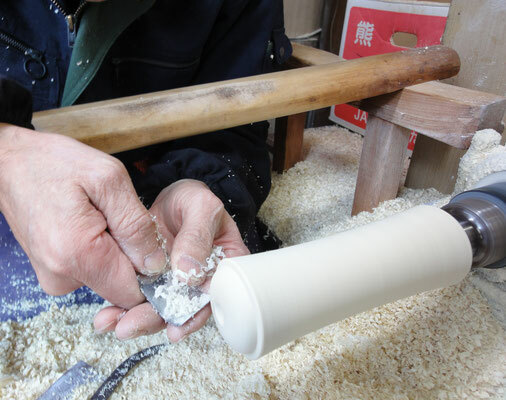 As a fourth-generation Naruko-Kokeshi craftsman, he inherited the craft of his celebrated father, grandfather. 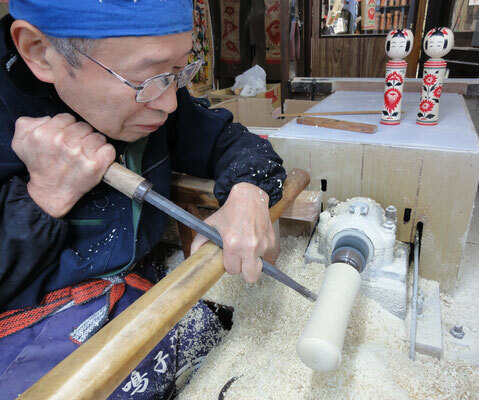 He is a multiple award winner in yearly Kokeshi competitions, receiving the Prime Minister’s Award*, the highest honor bestowed on Kokeshi artists. All of his work is easily recognized by the painterly designs decorating his dolls.